In addition to Tokyo and the cities located on the main island – Honshu, deserve special attention areas such as Kyushu and Okinawa archipelago. Kyushu is located in the north-west of the main island. The climate here is mild, the island is rich in greenery, among which there are elements of the bizarre volcanic terrain. The island has many hot springs. It was the first region of Kyushu, which gradually began to penetrate Western influence. Because the island is located in close proximity to China, the impact of the country penetrated here as early as the 4th century. 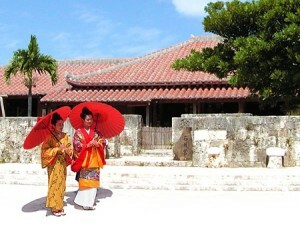 Korean culture has also influenced the development of the island. 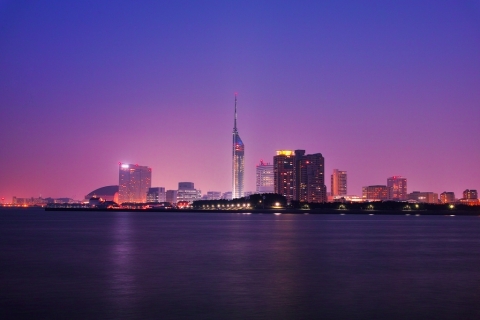 In the 16th century, when the Portuguese first arrived in Japan, they landed exactly in the region of Kyushu. “Gate” of Japan to the western world and is still the city of Fukuoka . The road from Tokyo to Fukuoka will take 6 hours if you go by express train. A stay in Fukuoka should at least then, to visit the Museum of Asian Fine Art , which stores real masterpieces of ancient painting and drawing.The museum exposition will significantly enrich the knowledge about Japan and enjoy the craftsmanship of Japanese painters. Fukuoka in different seasons pleases tourists spectacular events and festivals, such as holidayHakata Dontaku . Having been here, you can buy clothes from the world-famous silk Hakata-ori.If you drive a car in a neighborhood of the city, you can wander through the archaeological sites and witness the most valuable archaeological finds. 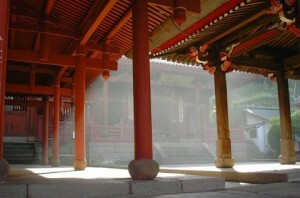 A special point of the route – the city of Nagasaki . This place has received worldwide fame after being in the Second World War, the city dropped the atomic bomb. Now, in place of its fall is Peace Park . Despite the notorious town is interesting for sightseeing. It is Nagasaki, for many centuries was the center of Japan’s communication with Western cultures, even in the period of the country’s isolation, which lasted from the 17th to mid-18th century. In Nagasaki can be traced to changes in Japanese culture under the influence of other cultures, such as examining the temple Sōfuku-ji , which combines elements of Japanese and Chinese styles.There in the city and the Catholic Church, a real rarity in Japan. After passing a couple of hours by car from Nagasaki, you find yourself in Unzen – Japan famous resort area, famous worldwide for its hot springs with mud. The area is named after the eponymous volcano with three peaks, the highest of which – Fugendake rises above sea level to 1360 meters. Shimabara City is famous for was located there in the ancient castle, which, unfortunately, has not survived. Not so long ago one of the towers of the castle was reconstructed in which the Museum is located today. The museum is dedicated to the struggle of the early Christians with religious dogmatism of the shogunate in the 17th century. 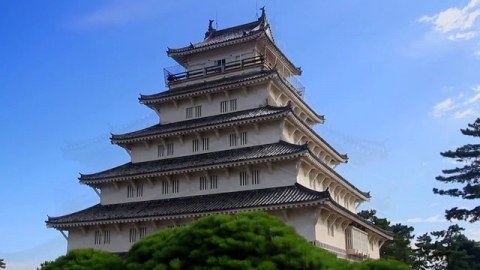 Another castle, which is perfectly preserved – Kumamoto . 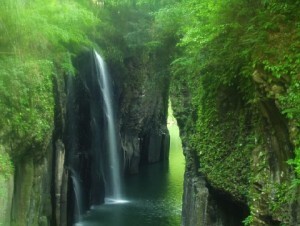 It is located in the eponymous town.Way to Kumamoto takes half an hour on the orient express. It is also the park Suydzendzi from which begins the vast territory of the National Park Aso-kudzu . Here you can see the largest volcanic caldera on earth. 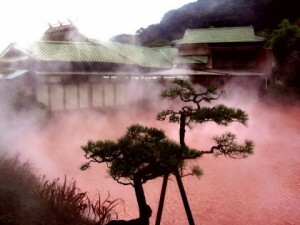 On the east coast of the island of Kyushu is the resort of Beppu , which is famous for its boiling mud ponds. Jets of steam ejected from the ponds, so strong that it can easily pick up the fountains of curative mud. Local resorts offer a wide choice of treatments based on medical mud and thermal waters. Another beautiful place of the island of Kyushu – the city of Miyazaki . A little more than three hours on a train – and you find yourself in a wonderful world of nature, rich vegetation, mild climate. A hundred kilometers from Miyazaki along the line of the coast stretches a beautiful park, which attracts many tourists. 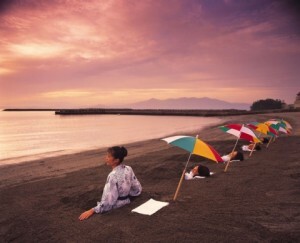 In two hours from Miyazaki is Kagoshima City , also famous for its spas. In Kagoshima is an active volcano – Sakurajima . One of the most famous Japanese resort with beautiful sandy beaches and rich vegetation –Ibusuki, located an hour’s drive from Kagoshima. Here you can take a sand bath, enjoy swimming and beautiful nature. If you fly out of the airport of the city of Kagoshima, in the forty-minute flight, you will find the island of Yakushima . Only here the ancient Japanese cedars grow, constituting the famousforest Yaqui-sugi . These majestic trees more than a thousand years. 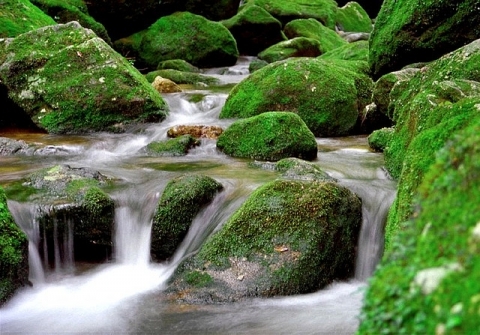 In addition to forests, Yakushima is famous for a variety of opportunities for outdoor activities – you can go up into the mountains, to learn the basics of canoeing, hiking in the forests and mountains. 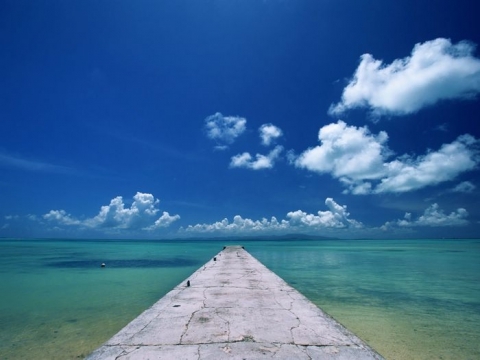 The archipelago of Okinawa has many small islands in the chain. Before the largest of them to fly for two and a half hours from Tokyo airport. 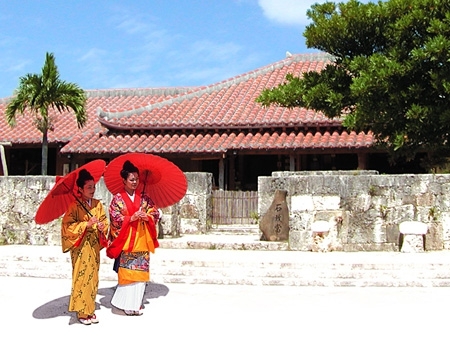 Okinawa – a great place for a beach holiday, there is a rich fauna, clear emerald sea, beautiful weather. Famous for Okinawa and coral reefs . 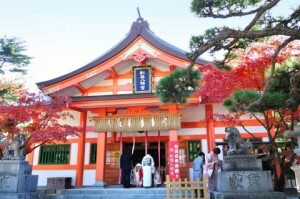 The most interesting places of Okinawa – a temple Naminoue relating to the Shinto religion. The temple is dedicated to the three gods, designed to protect the family of the emperor. Interesting temple Sogenji related to the Buddhist religion, which was built in honor of the rulers of the Ryukyu Dynasty. The national park of Okinawa all the space occupied by a memorial in honor of the events of the Second World War. The park has many monuments that immortalize the names of more than two hundred thousand Japanese died during the war.